We pass by these old, magnificent cherry trees on the walk to our son’s home. 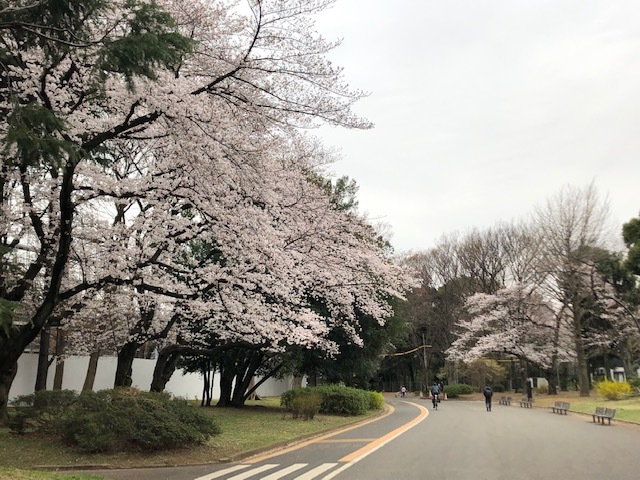 We have sometimes seen people picnicking underneath (ohanami: flower viewing). While not as busy as last week, we still had a semi-crazy week of activity, culminating with day at Tokyo Disneyland yesterday! Lots of our activity this week has centered around picking up the grandkids from school, and getting out with Meiling and her boyfriend a couple of times before they left on Wednesday. Tokyo Disneyland was an experience from start to finish. The day couldn’t have been better weather-wise – temperatures were in the 70s, and there wasn’t a cloud in the sky. Brett even got a bit of a sunburn on his face! Our DIL had thought the crowds wouldn’t be as big as last weekend’s, but Saturday’s attendance broke records, with online ticket purchases shut down early, and people turned away at the entrance because the park was at capacity. It was crowded. The shortest line we stood in for a ride was 45 minutes, except for the one Fastpass we were able to score – they were sold out for all rides by 11:00 a.m. Splash Mountain and Space Mountain had waits of over three hours, and many others had lines of over an hour. There were even lines of around 10-15 minutes to use the women’s restrooms! Lines at restaurants and snack carts were for anywhere from 30 minutes to an hour – crazy! Still, we had a great time and were able to go on several rides during the day with our grandson. Brett and I ended up walking six miles, and I took nearly 18,000 steps. Today we are resting our weary feet and bodies. Our school pick-up duties are going well, although our son or DIL usually pick up our granddaughter from her hoikuen (nursery school) – they rented a parking spot right by her school, so our DIL parks there for the day after dropping both kids off, then takes the train to her workplace (our son goes to work super early in the morning, before the rest are awake). In the afternoon, one of them picks our granddaughter up and drives home, and the other takes the train. We pick up our grandson earlier in the afternoon and bring him home. If both our son and DIL are busy however, we can pick up our granddaughter before getting our grandson. The only downside to that, if there is one, is that we have a semi-long walk from the bus stop to their house, and last Tuesday I was reminded of what it’s like to walk with a curious two year-old who refuses to be carried! Needless to say Brett and our grandson were at the house long before K and I arrived. Cherry blossoms and lanterns lined the final approach to the temple. 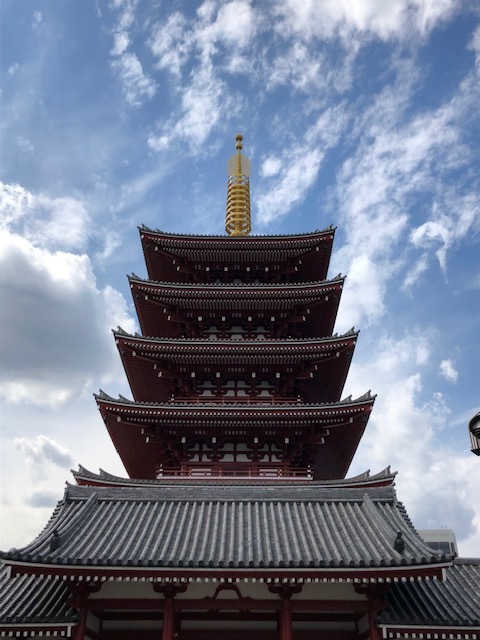 On Monday we visited Sensō-ji temple in Asakusa with Meiling and K, and were fortunate to have good weather for most of the time we were there. 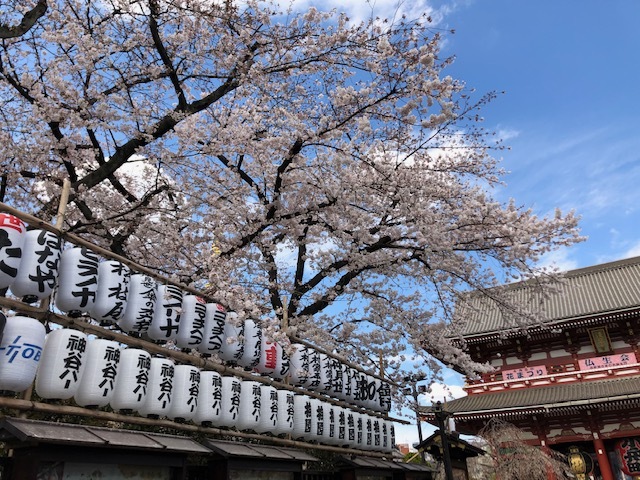 We visited with YaYu when we were here in 2017, but the pagoda was completely shrouded for painting/repairs and we were about a week too early for the cherry blossoms, so it was exciting to see both the pagoda and the blossoms this time. Meiling and K loved the Asakusa area so she and K stayed on after we had to leave. Brett and I each bought another omamori (amulet) from the temple – Brett’s was for “successful study and learning,” to give him a little boost for his calligraphy class, and I got one for “wishes come true.” I now have the trifecta – good luck, good fortune, and having my wishes come true! We saw many women (and men) in rented kimono. 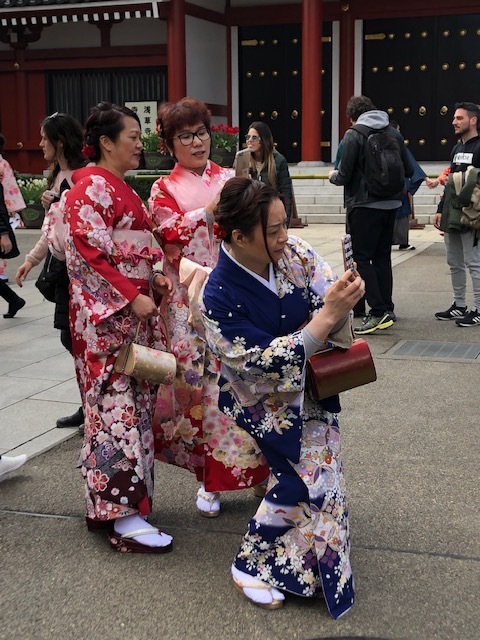 Dressing up enhances the experience for many visitors. Finally, we had an unexpected glitch during the week when our refrigerator stopped working for a couple of days this past week (the freezer continued to work fine though, thank goodness). We contacted our host, who had just arrived home from a trip to Europe, and were instructed to unplug the fridge for a couple of days and let it sit with the door open. One of her other apartments was empty though, the one located right next to ours, and we were able to store our food in the fridge there so we didn’t lose anything. It was interesting getting to see the other apartment – it was much smaller than the one we’re in, with less sunlight, but we liked the furnishings better and the kitchen had an actual oven! We never could have hosted Meiling and boyfriend in that space though, so we were glad we were given this apartment. Anyway, after two days we plugged in the fridge and it’s working fine now (the compressor apparently needed to rest and restart). Reading: I just finished a wonderful medical mystery/thriller set in Victorian Edinburgh, The Way of All Flesh, by Ambrose Perry, and have started Educated, by Tara Westover. However, I put six books on hold at the library the other evening, and if any of those come in I’ll have to put Educated on hold to read those so they can be returned on time. I also picked up another of Susan Spann’s mysteries when it was on sale for $1.99 from Amazon, so I am set for books for few weeks at least. I probably won’t see a couple of the library books though until late summer – the hold lists are l-o-n-g. Listening to: We’re enjoying a very quiet morning here! The heater comes on occasionally, but that’s the only sound. Watching: I watched The Highwayman on Netflix last week (I thought it was very well done), finished After Life and a series called Delhi Crime, and have been filling in with episodes of Father Brown. The show is filmed in the village where we’ll be staying when we go to England in the fall! Cooking: We don’t have much food in the house right now but we’re going shopping this afternoon, and I’ve got everything on hand to make tuna melts and a salad for dinner tonight. We discovered a discount grocery store in our neighborhood the other day, not too much further away from our house than the Tokyu store, so we’re planning to start shopping there this week. Happy I accomplished this past week: We were on time every day to pick up the grands, and we learned to ride the bus back to our son’s home versus taking the train. I’m a bit afraid of buses here as I never know where they are taking me, but we were able to figure out this route in a couple of days. 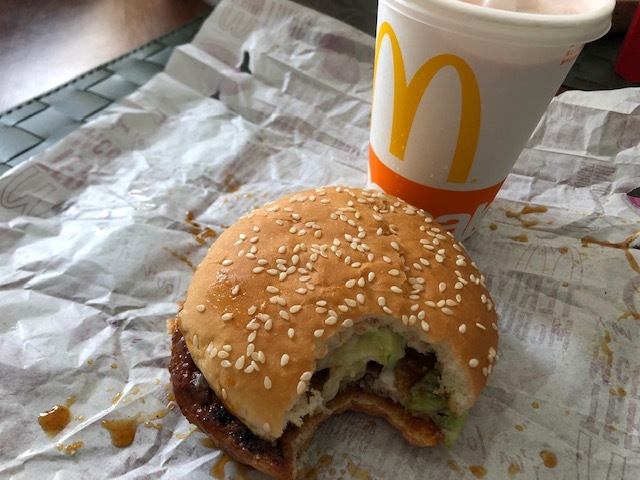 I finally enjoyed a teriyaki burger from McDonald’s. I always have one when I’m in Japan, and still can’t figure out why they’re not a thing in the U.S. because they are so simple (burger with teriyaki sauce topped with mayonnaise and lettuce) and so good. My one teriyaki burger plus a small strawberry shake. Love, love, love them, but one is enough for each Japan visit. Looking forward to next week: Other than picking up the grands, we don’t have anything specific on our calendar, and we’re looking forward to sleeping in most mornings. Weather permitting, I’m taking Brett on a mystery outing on Tuesday, and we may go back to Tokyu Hands on Friday. The same trees from the top picture, in full bloom a couple of days later. Thinking of good things that happened: Brett’s first calligraphy class went well and he enjoyed it immensely, but he’s got his work cut out for him (and is looking forward to it!). We were sad to see Meiling and K go but she admitted that she had fallen in love with Japan and can’t wait to come back. We’ve enjoyed great weather this week and actually had a couple of days where we didn’t need a coat or jacket. The cherry blossoms continue to bloom spectacularly. Brett picked up a branch of cherry blossom buds for me the other day from a nearby flower shop and I’ve enjoyed watching them open this past week. A branch of buds . . . Thinking of frugal things we did: We finally got Pasmo train and bus passes with some encouragement from our son and Meiling. The pass saves a few yen over regular tickets, but as we weren’t riding the trains every day we were fine with buying individual tickets. However, now that we’re picking up the grands every day the passes are far more convenient. We figured that all what we would have saved from the passes during the first six weeks would have added up to around 100¥, or a little less than a dollar. Every little bit helps though. We watched our spending at Disneyland, and bought one item for each grandchild, some bottled water, and a couple of snacks for ourselves but nothing more. 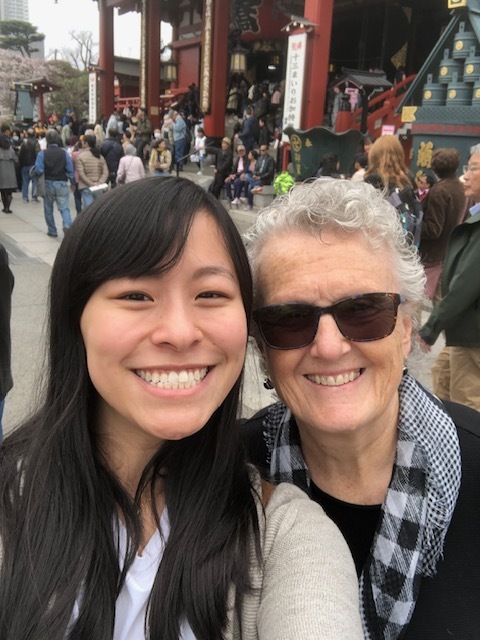 Grateful for: I’m feeling very thankful that we got to spend time with Meiling last week – she will be going out into the world very soon to make her way and we both know it might be a while before we see each other again. We’re also glad we got to spend some time with her boyfriend. We enjoyed his company too, and loved seeing them together. Japanese word of the week: kakueki teisha 各駅停車 I finally figured out that these words mean ‘local train,’ or a train that stops at every station versus the kyuukou 急行, or express train. Kakueki means ‘every station’ and teisha means ‘stop.’ For example, the station closest to our granddaughter’s school is a stop on an express train, but our grandson’s stop (the next one on the line) is not, so we always have to be careful to catch a local train versus the express. Our station, Sangenjaya, is a stop on the express, but our son’s stop, the next one down, is not. The kanji for the express or the local are typically displayed above one door of each car the train and I found out the hard way that it pays to look for them – the week before last I stepped on a train without checking and found myself on the express, watching our son’s station and three more go by out the window before the train finally stopped and I could turn around and go back. Life here returns to “normal” tomorrow. The last couple of weeks almost wore us out, but we’re catching up on our rest today and will be ready for the more relaxed week that’s coming up. 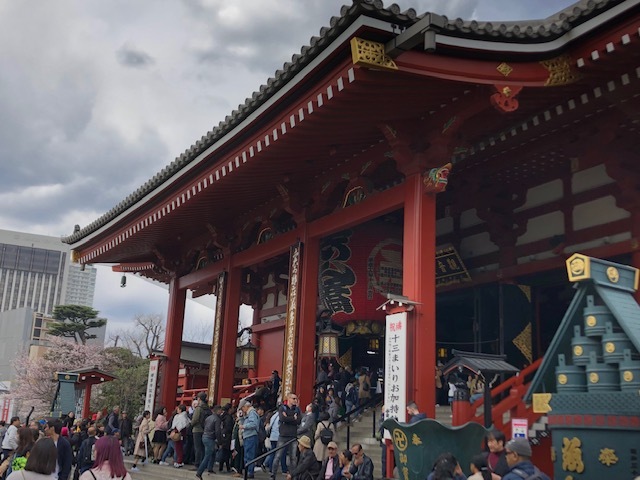 We’re still so happy to be here, and are still pinching ourselves that we have gotten to spend so much time here in Japan, and with our son, DIL, and grandchildren. Life is good! I hope you all had a wonderful week, full of good things and tasks accomplished! What a wonderful update on your adventures. Love that you are fully appreciating how great your life is! We are really enjoying ourselves here, and wish we could stay longer! We couldn’t ask for a better time with family nearby or visiting, and so many things to see and do, from the famous to the mundane. Beautiful photos! And how fantastic to combine adventuring with family time! I couldn’t have stood the crowds and wait at Disneyland. Then I’m not a theme park person really. I love Disneyland (I grew up very near to the California park and started going right after it opened!) but this was Disneyland at a whole different level! Still a lot of fun though, especially getting to experience with the grandkids. So glad you are enjoying your “staycation”. From your posts, it appears that longer stays will be the new normal for all your future travels. So glad you are getting to spend so much time with your family. I am enjoying all the pictures. Wish I could visit in person. This is exactly how we want to travel from now on! We’d stay at least one month in one place, and then branch out from there for short day or overnight trips. We have just a little over a month to go here in Japan, and neither of us can even bear to think about leaving. The time seems to be flying by though. Great photos, as always. The cherry blossoms. ❤️ They look quite different than I expected up close. Bolder pink…they almost look white/pink from a distance. Wonderful adventures with your family. Not sure I could make it through the insanity of an even more crowded Disneyland, but I’m glad you enjoyed it. It’s always fun to see it with kids…they’re so excited. We finally had some warm spring weather and it’s so uplifting. Laurel – the blossoms come in all sorts of shades of pink, from nearly white to a deep, almost shocking pink. The petals can be smooth or frilly (but there are always just five petals to a bloom). 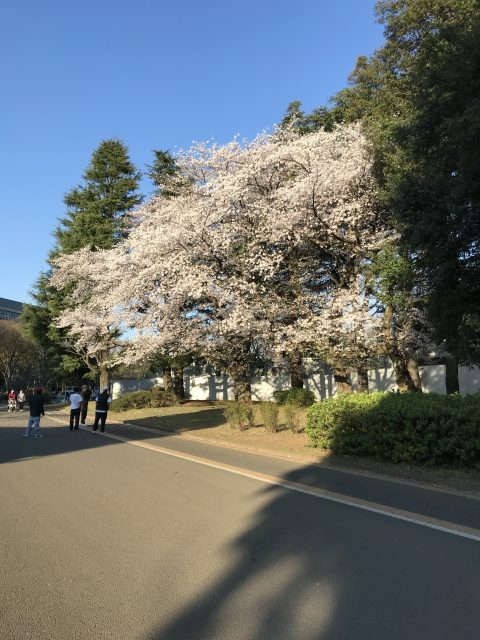 It’s because there is not just one variety of cherry trees, but loads of them! This week they will really begin to fade – the branch we have inside is already beginning to sprout leaves. I am so thankful we got to see them this year. They’re wonderful in places like Portland and Washinton, D.C. but those are all in one place – here they are EVERYWHERE! The Disney experience was wild, but we all managed to have a great time. Thank goodness for Messenger; we were able to communicate with each other throughout the day and were able to split up when we wanted or needed. Our son and family stayed until closing; Brett and I bugged out at around sometime after 8:00 p.m. – we were exhausted! We are getting warmer weather here too, and it is very appreciated. Japan cold is a different kind of cold than we’re used to!